Situated in Brovst, Pee Klims hus features a private pool. Guests staying at this holiday home have access to free WiFi and a fully equipped kitchen. The holiday home includes 4 bedrooms and a living room with a TV. The holiday home offers a sauna. Guests can enjoy the indoor pool at Pee Klims hus. 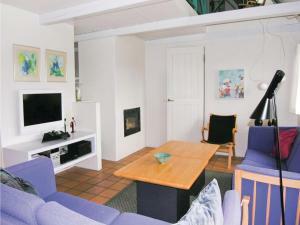 Aalborg is 19.3 miles from the accommodation, while Hjørring is 28.6 miles from the property. Aalborg Airport is 15.5 miles away. Situated in Brovst, Pee Klims hus features a private pool. Guests staying at this holiday home have access to free WiFi and a fully equipped kitchen. The holiday home includes 4 bedrooms and a living room with a TV. The holiday home offers a sauna. Guests can enjoy the indoor pool at Pee Klims hus. Aalborg is 31 km from the accommodation, while Hjørring is 46 km from the property. Aalborg Airport is 25 km away.